They are constructed of materials higher in hardness than most manufactured parts. Because of their high hardness, die materials can sometimes be brittle and susceptible to fracture. Die materials must be hard enough to resist wear yet tough enough to resist breakage. As a result, hardness becomes a compromise between these two requirements. Most tool steel is heattreated in a multistep process that begins with austenizing—heating to a temperature high enough to create a solid solution of iron and carbon. Next comes quenching to produce a hard martensitic microstructure. Quenched martensite, strong but very brittle, must be tempered to become tough and slightly more ductile. A survey of die failures conducted by the American Society for Metals (ASM) reveals that 70 percent of failures resulted from “irregularities during heattreatment.” Of these, 40 percent were due to failure to control tool-steel surface composition; 20 percent were due to quenching at too low a temperature or ineffective tempering; and 10 percent due to quenching from excessively high austenizing temperatures. Other causes include bad component design, abusive grinding, service abuse and selecting an improper steel grade. The results of this study suggest that any die-failure analysis must begin with a complete understanding and full investigation of the heattreatment process. Unfortunately, for most die shops and contract manufacturing companies heat treatment is a “black-magic” process. The die shop sends soft die details out to the local heat treater who returns to the shop the hardened details. The shop may perform cursory Rockwell hardness tests when the parts return and, if they meet hardness requirements, they usually are accepted regardless of how they may have been processed. 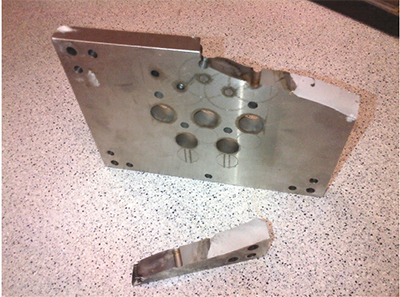 Die failures often occur due to overheating damage. Most die steels, relatively high in carbon or alloy content, are sensitive to damage by overheating during austenizing. Overheating causes grain growth, the formation of coarse martensite and excessive amounts of retained austenite, all of which results in brittle dies susceptible to failure in service—even when surface hardness is within specification. Ideally, most dies should be hardened in a neutral atmosphere to prevent carbon migration into or out of the surface. The base carbon content of the tool steel must be maintained in order to obtain the proper working hardness and service life. Accomplish this by heattreating in controlled, protective gas-atmosphere furnaces, vacuum furnaces and molten salt baths. Tempering of tools and dies is a critical operation. Give careful consideration to the tool-steel grade, its hardenability, section thickness and the die design. Tempering, which serves more than one purpose, first and foremost must relieve residual stresses. These stresses often are close to the tensile strength of the die material. Dies placed into service without proper tempering will likely fail quickly. Dies built from the higher-alloy grades of tool steel (D, M or T grades) require double and sometimes triple tempering. These grades retain significant amounts of austenite, which transforms to martensite during cooling from the first tempering. At least one additional tempering operation is required to relieve the stresses caused by the transformation that takes place during the first tempering step. Those that fail in service. Design faults that cause failures from heattreatment include the presence of thick sections adjacent to thin sections; sharp corners; blind holes; stamp marks; fillets with insufficient radii; poorly located or designed grooves or notches; abrupt changes in cross section and the location of holes that result in thin walls. Design faults that cause service failures include inadequate fillets in corners; improper clearance (especially if thermal expansion is involved, common to many stamping operations); thin sections; and abrupt changes in cross-section. During any failure analysis, the metalformer must investigate tool design, materials and the heattreatment process used for a given application. In many instances, tool design and material selection receive the most attention from the die shop and press shop, usually because the heattreat process is least understood and almost always outside their direct control.